Anyone can be exposed to triggers like seeing blood or experiencing emotional distress and lose consciousness, so it is always important, when at home, work, or even leisure, to have ammonia inhalants at hand, to prevent a total loss of consciousness and a possible injury. 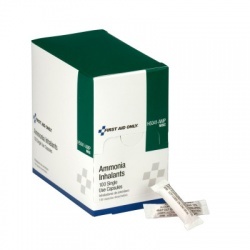 Keeping ammonia inhalants at hand is a necessity when a person faints to bring back consciousness. You just have to pass the ammonia inhalants under the nose. In case the person faints and hurts or gets injured by the fall, keep at hand bandages and other hospital quality first aid products. 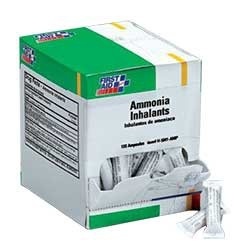 Ammonia inhalants can also be used when athletes are dazed or knocked unconscious, to restore consciousness and mental alertness, also to power lift them or make them more alert to perform better. 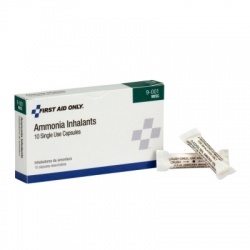 Also look under Ammonia Inhalants. Smelling Salts There are 3 products.